People say that money doesn’t grow on trees, so I bought a Money Tree instead. It may not bring extra cash, but the Money Tree, or Jade Flower Plant, can sure bring a smile to your face, which in the end is much more important. So whether you’re in it for luck or for the friendship (the jade flower is also called the friendship plant), this lovely succulent will be worth your time. The evergreen jade flower goes by many names. Officially, botanists refer to this succulent as the Crassula Argentea or Crassula Ovata. Commonly, though, people call it lucky plant, dollar plant, money tree, or friendship tree. A well-nurtured jade plant will have thick branches and deep jade-green foliage. Then, it may gift you with delicate white, or pink flowers come spring and winter. For a plant that people usually associate with luck, taking care of the jade plant requires very little trial and error. Although native to South Africa, people have been growing the jade plant for centuries in Eurasia and the Americas. Its popularity most likely stems from the fact that the Jade requires little care and supervision. Also, it is well-suited to indoor gardens, so if you meet its meager needs, the Friendship Tree will flourish and reward you with a long healthy life. Therefore, the jade plant is perfect for people who may not have the spare time to nurture an otherwise demanding plant. The money tree grows to a height of 3 to 6 feet and spreads out to 2 to 3 feet. This small frame coupled with its easy and quick bonsai production makes the jade plant an ideal starter into the bonsai process. As long as you prune them correctly, a jade plant will make for a hardy and attractive bonsai that will be very east to keep and maintain. Not only are jade flower plants easy to look after, but they’re also incredibly easy to start and propagate. You can even use fallen leaves or branches, although clipped foliage will have higher chances of success. Start a jade plant by clipping a leaf then waiting for the wound to dry and form a callous. Afterward, place the leaves in succulent-appropriate soil and moisten but do not oversoak. In about a month and a half, you’ll notice roots growing from the leaves. Finally, once the roots have established themselves, new foliage will follow after. Your Jade plant needs only A few hours of bright sunshine and weekly watering to be happy. This plant stores water in its entire body so it would be best to let its soil dry out completely before you water the succulent again. Hence, take care that you are not overly generous with water. Moreover, it’s notable that the most common cause of a dying jade plant is overwatering! Also, the jade plant may need to gradually acclimatize to bright light if it’s become accustomed to subdued indoor lighting. Conversely, a jade plant’s leaves may burn if you suddenly take it from a dimly lit room into a sunny spot. However, even in this slight the jade plant is forgiving and will soon grow new leaves. It’s also good to remember that bathrooms may not be the best place to keep your jade plant as they don’t thrive well in high-humidity. As your Jade plant grows, you will need to transplant it into a bigger pot and newer soil for continued nutrition. Again, you can consider succulent soil mixes, but generic household compost is okay. The important thing, though, is that the ground drains fast and well. When supplementing your jade plant’s soil, a diluted liquid fertilizer or a low-strength slow release fertilizer will suffice. Additionally, fertilizers with higher ratios of phosphorus would be best, such as 5-10-5’s. The phosphorus content will help your jade plant grow a thick trunk and strong roots. Also, If possible, choose fertilizers that are especially for succulents. The one challenge with jade plants may just be getting it to bloom. 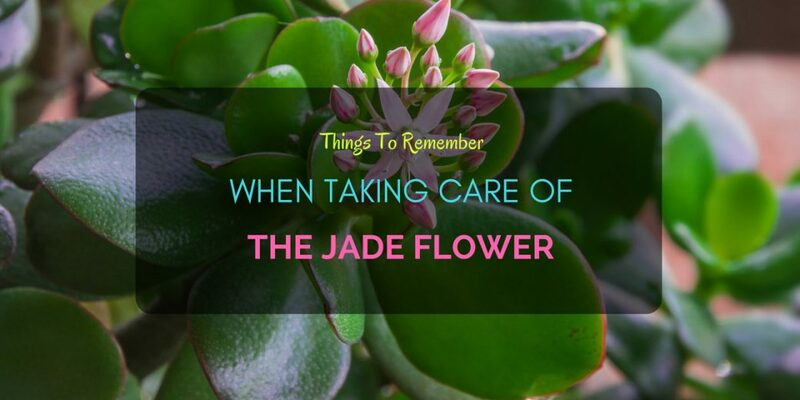 Although it is not uncommon for jade plants to grow many years without flowers, there are several possible reasons or this, such as overwatering, too much light, and a high humidity environment. Another reason for the lack of flowers is that the succulent may still be in its active growing stage. By rest, I mean helping the plant reach its resting stage when growth is minimal or completely absent. Typically, this stage happens naturally when the jade plant matures. However, you can induce this resting stage manually. First, stop feeding the jade and reduce watering. Next, move your succulent to a spot where it will get only a few hours of daylight. Then, during nights, keep the plant in complete darkness. Finally, if you do this right, you may be fortunate enough to see your Jade flower. Do you have any tips or question on Jade flowers? Let me know!